In the majority of cases, it’s not luck that makes people money, nor is it who they know. Rather, the people who make the most money in their careers are the ones who display discipline, and who have a definitive sense of purpose and heavy duty resiliency. The positive news is that even if you don’t possess these skills now, it is very possible to obtain them. The first step in doing so is to analyze how millionaires approach their careers and begin to alter your thought processes, practices and overall professional approach. To get you started, here are five ways the highly successful approach their careers. 1. Maintain an Open Mind and Active Imagination – Effective job seekers and entrepreneurs understand that tolerance and maintaining an open mind are necessities for anyone seeking wealth and prosperity from their job. They are not afraid of new ideas and understand that closed minds do not inspire faith, courage or belief. 2. Effective Job Seekers Are Success-Conscious – One of the main weaknesses of the average employee is their familiarity with the word “impossible.” They know all the rules that will not work. They focus on the things that cannot be done. Instead, superior job seekers think about possibilities and focus on solutions, not problems. Their thought process does not include the terms: lack, want, resentment, failure or capitulation. 3. Their Desire for Success Results in an Unmatched Determination– The most successful job seekers buy into the belief that desire is the starting point of all achievement. They aim to make their dreams a reality regardless of hurdles or current setbacks. The success-oriented understand that they are the masters of their own fate. They have taught themselves to displace destructive thoughts with a viewpoint that is constructive, visionary and promotes movement rather than stagnation. 4. They Possess a Keen Ability to Influence Others – Successful individuals have an ability, whether inherent or learned, to influence and gain favor from others. They greet others with enthusiasm and show a sincere interest in those whom they work with. Their positive energy is contagious and allows for heightened productivity both in themselves and those around them. This belief system naturally combined with a deep knowledge of their business lends itself to others wanting to be around them. 5. They Remain Optimistic in the Face of Adversity – Highly paid individuals don’t quit in the face of adversity. They realize that everyone makes mistakes, that every leader stumbles and falls. When this happens, they regroup and get going again with a renewed speed, sense of purpose and confidence. The global business world will knock everyone off course from time to time. 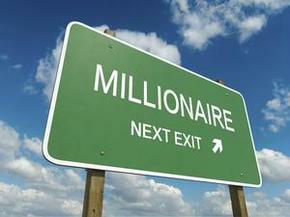 What makes millionaires so highly paid is their resolve and sense of purpose. Simply knowing about the above five facets is not going to suddenly catapult you into the career stratosphere, which brings us to the unifying component of success. It isn’t enough to know that successful people keep an open mind, or focus on success itself, or have the skills to genuinely influence others. You’ve got to be willing to put in the time and effort of forming these five new habits, not just 9-5 at the office, but throughout your whole life. These are baseline things that must be practiced consistently if you are to achieve your best level of success and fulfillment in your career.